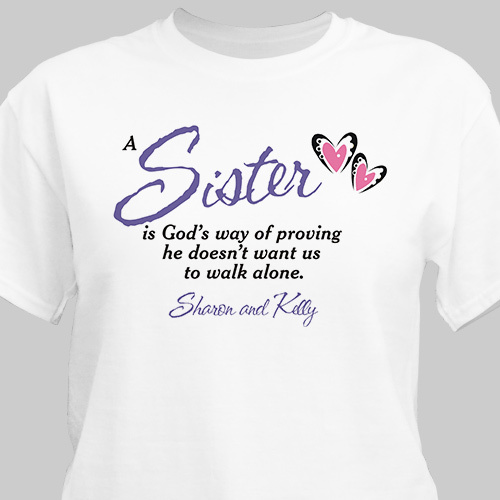 Express your love for your sister by giving her this beautiful God's Way of Proving Personalized T-shirts. Distance & time will never separate the love you have for one another; that love is expressed in this one-of-a-kind Sisters Personalized Shirt. Our Customizable Shirts are available on our premium white 100% cotton Personalized T-Shirt, machine washable in adult sizes S-3XL. Also available in Pink and Ash Grey. Includes FREE Personalization! Personalize Sister T-shirt with any title (ie: Sisters) and up to 6 names. I love all things personalized. I really like this Sister shirt. The T shirt is nice. They are for my sister. They appear a little small for a Medium. I am hoping they fit when i give them to her. Our Personalized Sisters T-Shirts feature the finest quality tee shirts and custom printing. Your Sisters will love to wear these Personalized Sister T-Shirts Select one for each of your sisters. These pesonalized sisters shirts make excellent gifts for your sisters on Sister's Day, Family reunions or just a special girls day out. GiftsForYouNow.com also carries additional Sister Gifts & Friendship Gifts. Shop GiftsForYouNow.com for all your gift giving needs.